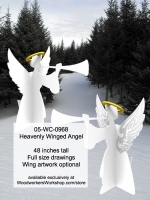 Our Heavenly Winged Angel stands 4 ft tall and can be made from one sheet of plywood. We also include the unique wing artwork if you wish to decorate your angel. Or you can just paint everything white. This project would look great in the yard, on the porch, in a store window or anywhere you like! Choose to paint as little or as much detail as you want. Custom sizing available upon request. A sheet of plywood measuring 48 x 72 inches at a minimum.